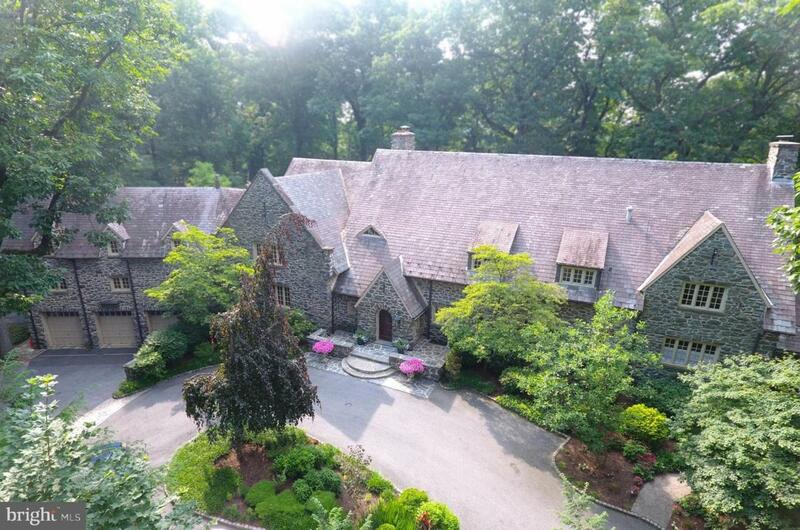 Marvel at this one of a kind castle-like estate nestled in a graceful wooded lot. This stately 8 bedroom, 9 total bath Manheim Township masterpiece is a once in a lifetime opportunity to be the king or queen of your manor. An elegant circular driveway opens up to private and beautifully landscaped woods, which surround this majestic stone home. A large wooden door welcomes you into the charming and stylish grand room with eclectic mercer tile, fireplace and large bay windows for great natural lighting. The sophisticated kitchen boasts hardwood flooring and one of two dinning rooms. It features lovely custom cabinetry, a large center island with breakfast bar and a unique kitchen fireplace. This space is ideal for family gatherings, friendly entertaining and delicious spreads. For more formal gatherings, the formal dining room is stunning with a striking chandelier and plenty of space for a long, elegant dining table.The master suite is simply enchanting with wooden trey ceiling, raised platform for a king-sized or larger bed and its own fireplace. A refined wooden staircase leads down to a must see private bath suite, which includes a large sitting room with fireplace, marble flooring, a centralized whirlpool tub surrounded by wooden columns as well as wooden closets, ceiling and detailing throughout. The remaining suites are spacious and comfortable with their own full bathrooms and sitting rooms. A convenient loft space in the upper lever is perfect for a game room. The beautifully finished basement features a stone fireplace, wooden built-in cabinetry and entertainment center, a charming wine cellar and exercise rooms. The exterior the grounds are breathtaking with impeccable landscaping, stone walkways, a fountain, gardens, patio and large deck to enjoy a quiet retreat in nature or entertain guests. A classic backyard and three-car attached garage complete this unique property which is nothing short of a work of art. See attached PDF (Room Details) for additional room details.